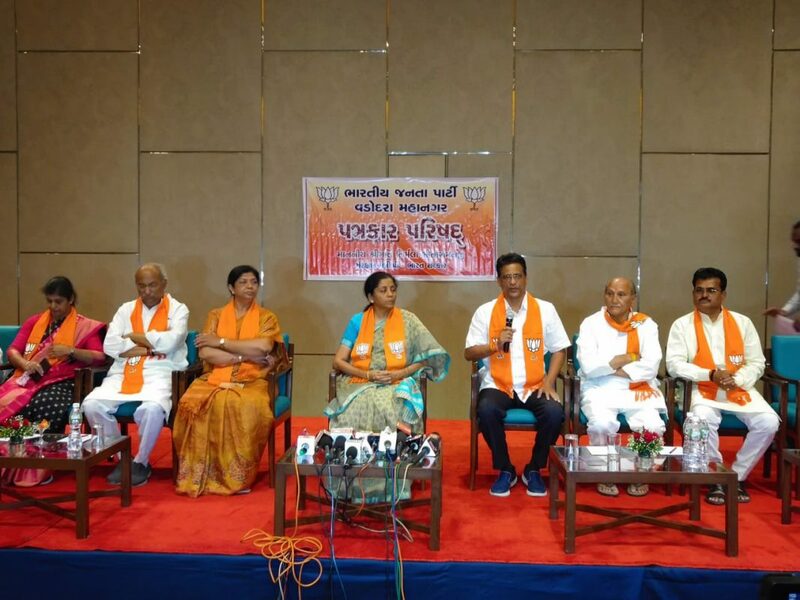 Minister of Defence Nirmala Sitharaman visit Vadodara in support for the BJP candidate Ranjan Bhatt and said the election is important just like the previous one. She said in 2014 it was to remove a corrupt government and now they want to show that the country is safe in the hands of our Prime minister Narendra Modi. The defence minister arrived for a conference and point out the importance of election this time also just like the previous one. She said the country is safe in the hands of Prime Minister Narendra Modi and will continue the progress. They want to continue the steady economy and once again want Modi government at the centre. She point out important works in Vadodara completed in last five years and in the pipeline. First Railway university, High speed train training centre, Second green airport in the country, IIIT, Modern railway station, freight corridor, Agriculture science centre, Chayapuri and Pratapnagar as sattelite railway stations, central university for HRD, National Rail and Transport institute, manned railway crossings, include out growth areas in municipal limits, central warehouse and railway container depots in Vadodara and others. About Balakot airstrikes she said its preemptive strike to destroy the terrorist camps. After the Pulwama suicide attack they recieved strong intelligence inputs about such attacks and they act to destroy the camps. She also said that Pakistan always says they are also victims of terrorism then why not they destroy the camps of their own. We wait for their action and after 10 to 12 days strikes the camps. About questions related to Pakistan F-16 and a foreign paper article, she said IAF already released a statement where they talked about the radar data and aircraft signature messages which shows it as F 16. A piece of missile was also found which was used on Pakistan F 16 shows the things. She request the paper and reporter to study the subject closely. Indian made Tejas showed it’s prowess in the Malaysia air show and the defence minister said talks are on with the countries for the selling deal. She said other countries also shown their interest in the Tejas deal. She said to be came here in support of the local candidate Ranjan Bhatt and said the BJP will once again regain the power.